…but, I’m assuming these albums will be reviewed to death by the journo world (phew! I am so linked out), so I’m going to focus on a new single release by a not so well known band called We Smoke Fags. 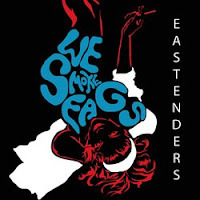 We Smoke Fags describe their style of music as ‘Electro Skunk Rock’ and list their influences as The Specials, ‘Blue Peter bring and buy sales’ and ‘The Countdown Theme’. …and yes they all do smoke fags (that’s cigarettes if you’re American). Joey seems to have started the band as a MySpace project. He had uploaded a series of garage band demos and flippantly called them We Smoke Fags. Shortly after he found himself as a featured artist on MySpace, getting 50,000 plays a day. At this point it occurred to him that he may be onto something so he approached Lee and Harry who he’d met working behind the bar at Nambucca, on Holloway Road, about forming a band. After a few shows at Nambucca the band got offered a slot touring with Does it Offend You Yeah? P.S. They say their single has nothing to do with the popular BBC1 TV show, ‘Eastenders’. Jacob Golden Gig In My Living Room!